Global ad spend is on track to grow 5.5% this year to $537 billion, while Internet advertising will account for nearly one-quarter of that, at $121 billion, according to the latest forecasts out from ZenithOptimedia, a division of ad giant Publicis. Overall it’s a generally optimistic picture: the researchers say that this is the third revision of its 2014 figures that it has made, with this latest a 0.2 percentage point increase since December, “after recent signs of stronger growth from the Americas and Asia Pacific.” And in Europe, where ad spend was down by 3% in 2013 and has dropped by 15% since 2007 and the start of the financial crisis, ZenithOptimedia now thinks it will grow by 0.7% in 2014, its first growth since 2010. As a point of comparison, in 2013 global ad spend was $503 billion, according to the same researchers. And while companies like Google have dominated the Internet ad space with search ads, the rise of ad tech and social media (read: Facebook and Twitter) appears to be changing that tide: Zenith predicts that by 2015 Internet display will overtake paid search at $74.4 billion versus $71.1 billion. This year, however, search still rules the roost, with $55.7 billion projected to be spent on search ads compared to $51.8 billion for display and the more slow-growing area of classified ads, which will bring in $13.5 billion, and growing by just 6% annually from now until 2016. Meanwhile, mobile continues to be a small but fast-growing proportion of business. In 2013, $13.4 billion was spent on mobile ads, some 13% of all Internet ad spend and 2.7% of all global ad spend, but by 2016 that will rise to $45 billion, or 28% of Internet ad spend and 7.6% of total ad investments. The researches note that mobile includes all Internet ads to smartphones and tablets, including display, classified, search and in-app ads. ZenithOptimedia says that Internet advertising will remain the fastest-growing category for ad spend, although its pace is slowing down somewhat. In 2013, it grew by 16.2% but that will decline to 16% between 2014 and 2016. Within that, display at 21% is outpacing that growth, and even more impressive is the rise of social media advertising, which is currently growing at 29% each year. Part of this is down to audiences — Facebook is now at well over 1 billion users and will soon cross 1 billion on mobile alone — and part is down to the rise of ad tech, which not only lets brands and businesses have more control over what they buy and where it’s being seen, but also provides a greater amount of data to be able to measure the impact that their marketing investments are having. Ad tech, in short is fuelling the machine. “Measurement agencies are investing in research that should measure consumers’ exposure to traditional display ads more accurately, and track their exposure to video ads across desktop computers, tablets and television screens,” ZenithOptimedia’s researchers write. Even traditional media outlets are falling in line, with some broadcasters now offering packages that include both online and TV components, and of course companies like Twitter working very hard to find a symbiotic relationship with them, where Twitter’s conversation platform becomes the “lean forward” component of the “lean back” experience of television. Online video — whether its market-leading YouTube or the many other avenues people have these days to consume video on the Internet — will outpace display ads, but not social media ad investments: it will grow 23% this year. Although Google’s YouTube does dominate the world of online video, that slightly slower growth compared to social could be one sign of why Google may be keen to make more investment into buying a successful social media brand in the future. Interestingly, the growth of paid search seems to be slowing down by comparison to all of the above (but, of course, not in comparison to traditional media; more on that below). Paid search will grow by 13% each year up to 2016. What’s interesting is that Zenith notes that this will drive more ad tech even into the paid search space: richer product information, images within ads, better localisation of search results, and mobile ad enhancements like click‐to‐call and geo‐targeting are among the features, it notes. Another is the fact that companies like Google are getting increasingly involved in specific vertical search markets — something that has become a major bone of contention in regions like Europe. In terms of how digital ad spend is comparing to other mediums, television is still outpacing the rest of the market in terms of total ad spend, and it will continue to do so for years to come. In 2013, TV accounted for 40.1% of ad spend, compared to a combined 21% for desktop and mobile Internet. Even by 2016, there will still be a gap of more than 10 percentage points between the two while newspapers, magazines, outdoor and radio will all see varying degrees of decline. When it comes to regions, the U.S. remains the biggest market for advertising, at more than three times the value compared to the next-biggest market. In 2013, the U.S. accounted for $167 billion of ad spend, and by 2016 that will rise to $191 billion. Japan, disproportionately when you consider the size of the country, was number-two in 2013 with $53 billion in ad spend, but by 2016 it will be handily overtaken by the juggernaut called China. By then, China will bring in $57 billion compared to $56 billion from Japan. 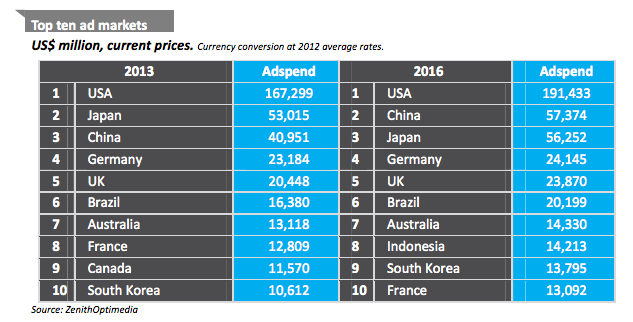 German is and will remain the biggest ad market in Europe, followed by the UK. In the top 10, Canada will eventually drop out to be replaced by Indonesia — a more general sign of how Asia continues to rise.